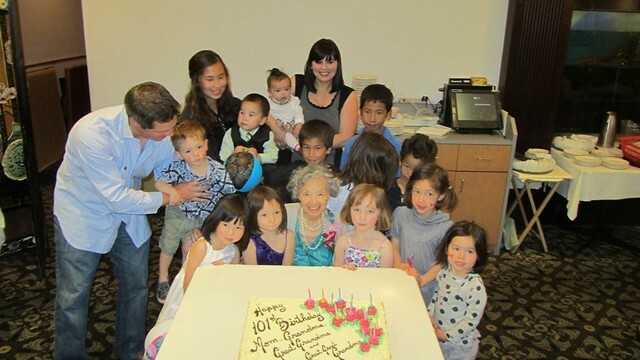 Tonight is the 102nd birthday party for my grandmother. She was born in Victoria, the grand-daughter of Rev. Chan Yu Tan, who came to Canada in 1896. While her father Ernest Lee and husband Sonny Mar, both paid the Chinese head tax, they died decades before the apology. Life was very tough in those days, Granny was one of 14 brothers and sisters. After her father died, she and her 2 elder brothers helped to raise the rest of the siblings with the youngest being only a year old. I love my grandmother, my mother’s mother… When I grew up, I saw her a lot, as she lived on the next street. She tells me that when my mother came home from the hospital after giving birth to my younger brother – I didn’t recognize my now non-pregnant mother, and I ran back to Granny who had been babysitting me, while Dad brought Mom home from the hospital. I am sorry for the time, when I was a child, and Granny was child-minding me and my brother – and I locked Granny out of the house. I am grateful for the many times when Granny would listen to me play my accordion, over the phone… to encourage me in my practice. This morning I drive to the airport to pick up my Hamilton area cousins who are descendants from Granny’s younger sister Esther, who was #4, following #1 Henry, #2 Arthur and #3 my grandmother Mabel. Today is also her younger sister Helen’s 97th birthday in Nanaimo. A few years ago, Auntie Helen’s friend was listening to CBC Radio’s North By Northwest Program with host Sheryl Mackay. Sheryl had interviewed me about the Chinese-Canadian History Fair previously in Vancouver, but announced that there was a similar history fair at Malispina College (Now known as Vancouver Island Univeristy) and quickly brought Auntie Helen to see the exhibit. Auntie Helen walked around the room, then suddenly recognized pictures of her grandfather. This entry was posted in Canada Day, Chinese Canadian History, Rev. Chan family, Todd Wong on June 30, 2012 by admin.